Fresh mint is a wonderful tonic for the digestive system, and garlic is nature’s wonderful antibiotic. Watch out for the fresh garlic taste, maybe not a good idea to eat just before going out! Wash and chop the coriander and mint. Place everything in the blender and blend until macerated to a paste. Add only as many chillies as required, depending on strength enjoyed. Add a little water if needed to get into a paste. Serve on its own or by add a tablespoon to some yoghurt. 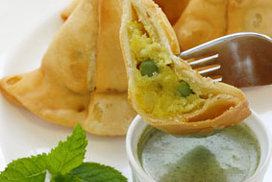 A great accompaniment as a dip, with popadoms or with curries. Make extra and divide into freezer bags or small containers for freezing. You can freeze some in an ice tray and take out a cube at a time when needed. Pomegranate powder is available from your local Asian food store.